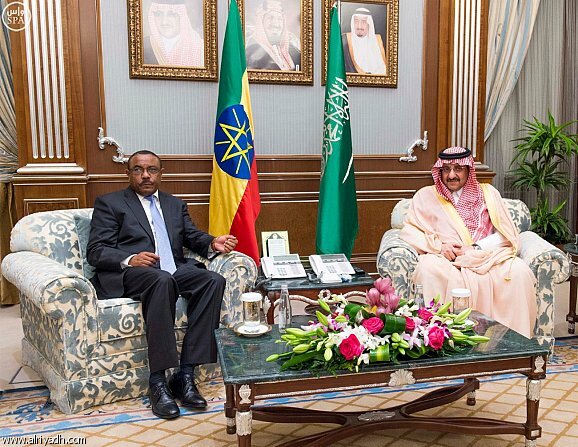 Ethiopian Prime Minister, Hailemariam Desalegn, has told a local private newspaper that Saudi Arabia and the UAE will bear the consequences of Ethiopia’s response if their operation in and around Eritrea’s Port of Assab supports the ‘Eritrean regime’s destabilization agenda against Ethiopia.’ He made the remarks after a recent United Nations monitoring group report indicates that Saudi Arabia and the UAE have leased the Port of Assab for 30 years from the Eritrean government in their coalition to fight the Houthis in Yemen. The Premier also told reporters of the newspaper during his first interview with a local private media outlet that Ethiopia absolves itself of any responsibility in case of disruptions to their operation in the area due to its proportionate response to any provocations by the Eritrean regime. “Although we understand their objective, we were not consulted before the countries reached to this agreement. We have a right to protect the sovereignty of our country. And this might depend on the actions of the Eritrean regime,” Hailemariam said. The Prime Minister, however, said that there is no evidence Saudi Arabia and the UAE had leased the Port of Assab from Eritrea for 30 years. Experts say the relationship between Eritrea and Ethiopia is arguably the most important and volatile in East Africa. The fall-out between the former brothers-in-arms initiated a two-year-long border war in 1998, which claimed around 100,000 causalities, and cost billions of dollars. Many say the ‘no war, no peace’ situation between the two countries continues to serve as the main source of regional instability in the Horn of Africa.